Wilma Lee is a Coast Guard inspected passenger vessel. 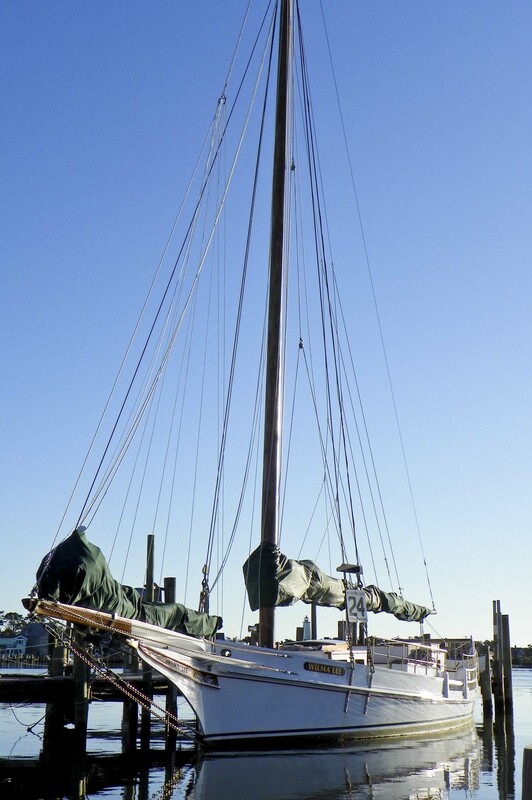 In recent years, she has been sailing as an education and tourism vessel out of Ocracoke, North Carolina, but now has been acquired by the Annapolis Maritime Museum, returning to the Chesapeake Bay and sailing out of Eastport. In 1940, fifteen years before he built Rosie Parks, Martha Lewis and Lady Katie, Bronza Parks built his first skipjack. Asbury Lewis had lost his boat in a storm and didn't have the money to buy another. Asbury's sister, Katie, was Bronza's wife. Orville Parks had Bronza, his brother, build the skipjack for Asbury to sail, while Orville would keep sailing his own skipjack, Joy Parks. Wilma Lee displays the unusual fore-and-aft bottom planking at the stern that builder Tom Young had used on Joy Parks, indicating that Bronza probably used Young's design as a model for his own skipjacks. Orville sold half ownership in Wilma Lee to Asbury, creating a partnership from which Orville would net half the owner's share of income from the new boat, while still taking home the owner's and captain's shares from Joy Parks. They jointly named the skipjack—"Wilma" for Orville's older daughter and "Lee" for Asbury's granddaughter, Barbara Lee. The original trailboards were misspelled "Wilmer Lee." Her first correctly spelled trailboards are preserved by the Calvert Marine Museum at Solomons Island, Maryland. Orville and Asbury had an agreement that the one who died first would make payment to the other's widow to allow the survivor to own the boat outright. Asbury dropped dead on his boat in the summer of 1962 and Orville fulfilled the pact, eventually selling Wilma Lee to Bronza's son-in-law, Ralph L. Ruark, who continued to sail her out of Wingate. After the Deal Island races began in 1960, Ruark sailed Wilma Lee to back-to-back wins in 1963 and 1964, with another victory in 1977. Ruark began having health problems and sold Wilma Lee to Robert Wilson in the late 1980s. Wilson previously owned Elsworth and described Wilma Lee as a much easier boat to sail. Ralph Ruark's daughter, Patti Ruark Hall, recalled Wilson running the boat into the drawbridge at Tilghman Island, breaking the mast. "He and his brother both jumped overboard...they were ok...but lots of damage to Wilma Lee," she said. "He called my Dad to tell him...He said, 'I know you will hear about it so you might as well hear first hand.'" Wilson and Wilma Lee survived another close call. They were participating in a Maryland state program that puts skipjacks to work after their dredging season ends by paying them to transfer seed oysters—spat—from protected areas to exhausted oyster beds. Aging boats that are accustomed to hauling no more than the 150-bushel limit can be piled with up to a thousand bushels of spat on deck, contained from spilling over the low rails by plywood boards. Wilma Lee was piled high one spring day in 1992 when the weather turned foul. A sudden wind shift caught her boom and caused a jibe, where the boat's stern passes through the eye of the wind. An unplanned jibe in a skipjack can be a treacherous move. Wilma Lee's 52-foot boom whipped from one side of the boat to the other, knocking down Wilson and causing the boat to heel over perilously before he was able to regain control. There apparently were renovations done during Robbie Wilson's ownership. A photo taken during that time reportedly shows a new modern stainless steel wheel for the helm. The history of Skipjack Nathan of Dorchester, built 1992-94, records that she received Wilma Lee's old wheel and gearbox, although the gearbox needed to be re-engineered to adapt it from Wilma Lee's spud rudder (below the hull) to Nathan's barn-door rudder (behind the stern) configuation. Herb Carden purchased the boat in 1995 and took her across the Chesapeake Bay to his home in Kinsale, Virginia. He hauled her out in 1997 for repairs and ended up almost fully rebuilding Wilma Lee over the next five years. About all that was left of the original wood was the stem, mast step and keelson. Shipwright John Morganthaler oversaw the reconstruction. "We hauled it and the transom about fell off," he recalled. Chairman of the Board of Potomac Supply Corporation, a lumber company, Carden had access to plenty of materials for the job. The company pressure treated all the wood and only stainless steel, Monel or silicon bronze fasteners were used. "I wanted to build it so it would look good and last for a long time," said Carden. At her slip on Carden's waterfront estate, Wilma Lee was a pampered lady of leisure. She has a well appointed galley with stove and microwave. Her deck was fiberglassed for long wear and sure footing. Carden installed twin 150-horsepower diesel inboard engines, along with a pair of 250-gallon fuel tanks to feed them. He reported being able to get her up to 12 or 13 knots, an impressive speed for boats that usually are considered moving right along at about 8 or 9 knots. Under Carden's ownership, she raced under sail in the Turkey Shoot Regatta on the Rappahannock River, but no longer dredged. In early 2012, though, Carden sent the lady of leisure back to work, donating the boat to the nonprofit organization Ocracoke Alive. The boat had a nail-biting trip down the Intracoastal Waterway to Ocracoke, North Carolina, barely making it under several of the bridges. When the mast needed to be removed as part of a Coast Guard inspection, the organization took the opportunity to trim a foot from the top of the mast to make any future waterway trips less stressful. The changes necessary to get her passenger vessel certification from the Coast Guard took until October 2012. Wilma Lee now is licensed to carry up to 42 passengers. She had a challenging 2013 season, as problems cropped up and glitches got worked out, so everyone was looking forward to the 2014 season. However, the Fourth of July brought unexpected fireworks as Hurricane Arthur struck. $70,000 later, with a new boom, a new set of sails and reconstructed stem, Wilma Lee finally had a good season in 2015 in her new life as a tourism and educational vessel. However, the struggles to keep her safe on the Outer Banks and find available captains led Ocracoke Alive to begin searching for a new owner for the boat in 2018. We are happy to report that the Annapolis Maritime Museum acquired her $60,000, returning her to the Chesapeake Bay to sail out of the museum's two campuses on Back Creek. Please help keep this information up to date by submitting news or corrected facts about any of these boats and letting us know of skipjacks not yet included on this site. © Copyright 2015-2019 Cyndy Carrington Miller, all rights reserved, including text and photos, unless otherwise attributed.